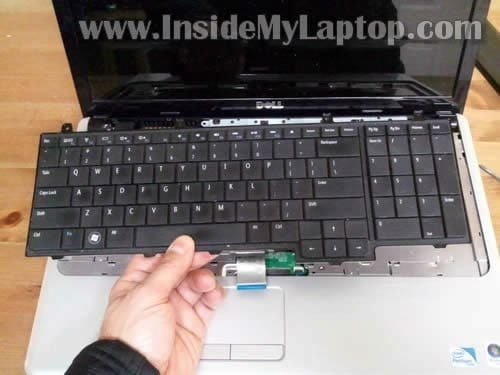 In this guide I’ll be replacing the keyboard on a Dell Inspiron 1750 laptop. My customer spilled something on it and some keys stopped working completely. 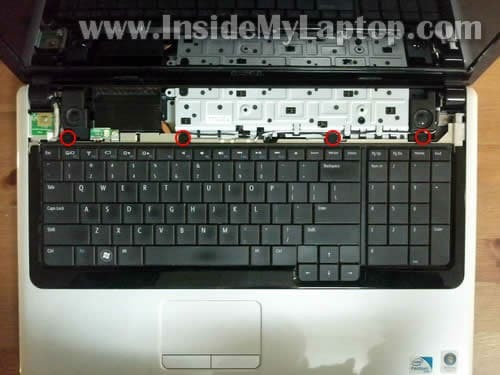 Before you start the disassembly process, make sure the computer is turned off and battery removed. There are two screws securing the speaker cover on the bottom. Lift up one side of the speaker cover with a small flathead screwdriver. I’m using a plastic stick for that. Remove four screws securing the keyboard to the top cover. 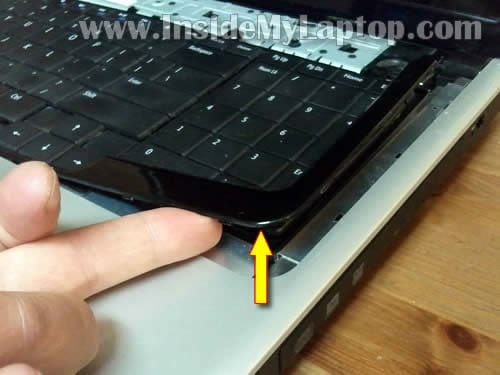 Carefully lift up one side of the plastic bezel with a sharp object. There are small latches securing the bezel. You’ll have to wiggle it a little bit in order to disengage those latches. Slide the keyboard towards the display. Now you should be able to access the keyboard cable connector. You can remove the cable from the connector ONLY after the connector is unlocked. In order to unlock the connector lift up the right side of the brown locking tab with your fingernail. The locking tap will pop up at a 90 degree angle. Finally remove the keyboard and replace it with a new one. 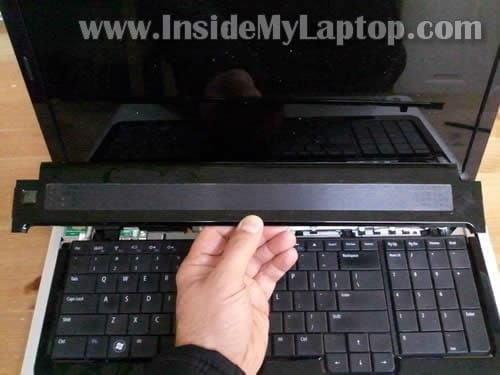 In the next post I’ll explain how to replace laptop LCD screen. I had to use my laptop with external keyboard for over a month because I spilled soda on the keyboard and 10 keys stopped working. It was such a pain. I didn’t have money to pay for repair. They asked too much. New $19 keyboard from eBay works like new. I’m glad to help. The main idea of this site to help people like you. While replacing my keyboard, the plastic keyboard connector broke, so I can’t lock the ribbon into place. My understanding is I need to find a dead motherboard in order to find this piece and get my system back up and running. Does that sound right? I’m searching eBay for a motherboard but not sure which part number I need. While replacing my keyboard, the plastic keyboard connector broke, so I can’t lock the ribbon into place. Do you still have the broken tab? Here’s what you can try. 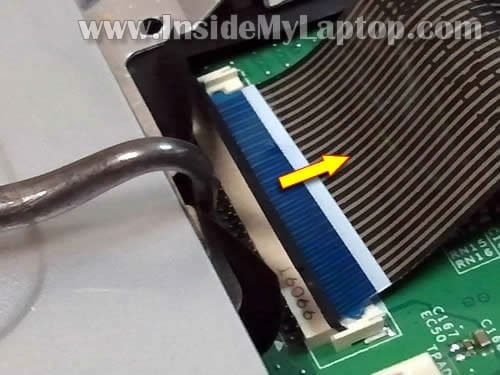 Place the keyboard cable back into the connector. Place the broken tab on the top the way it was before. Secure the connection with electrical tape. My understanding is I need to find a dead motherboard in order to find this piece and get my system back up and running. Does that sound right? I don’t think it’s going to work. The broken tab is attached to the white connector base which is soldered to the motherboard. 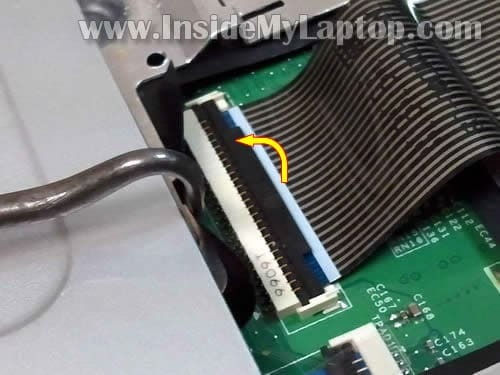 Even if you can find a dead motherboard, I doubt you can resolder the keyboard connector. 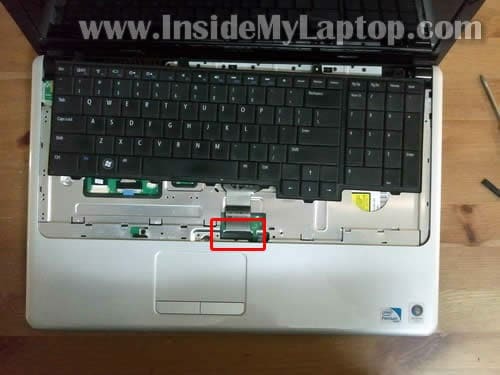 Hello, any chance to make a guide to disassembly Acer Aspire 1800 ? Didnt find one, sorry and thanks for your wonderful job! 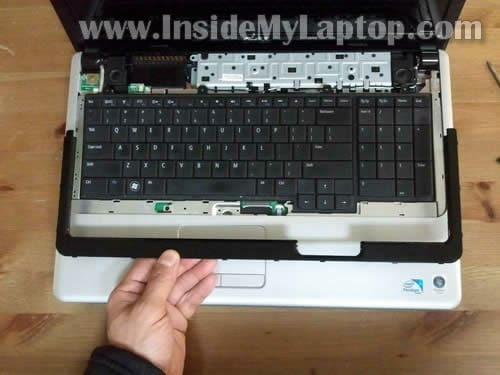 any chance to make a guide to disassembly Acer Aspire 1800 ? After a quick search I found it here. External link to pdf file. 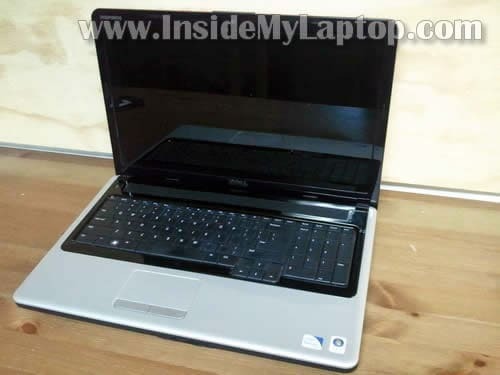 I inherited one of these laptops for photo work and the left click mouse pad button was mashed down, full of gunk. Besides it being over loaded with chips, coke, whatever was spilled or eaten over it, the keyboard still worked fine, at least for now. I had to get down to the aluminium front bezel (underneath the keyboard) and was having trouble getting the black keyboard bezel off, it was glued down with soda. I was worried about breaking it or the keyboard and you’re tutorial helped me realise the black bezel has to removed, before the keyboard, because you have to lift up the lcd edge (farthest edge) of it, to “slide” the tabs out of the (closest) slots, then unlock the ribbon to remove. I was able to go forward and get the aluminium bezel off, lots of connections, to repair the left clicker. Also found where to install a bluetooth adapter along the way (under the upper black speaker bezel). Thanks again, a great laptop and a great tutorial. Thanks that was great ! I am my wife’s keyboard hero ! It took me all of ten minutes to replace the keyboard. Is there a career in this ? 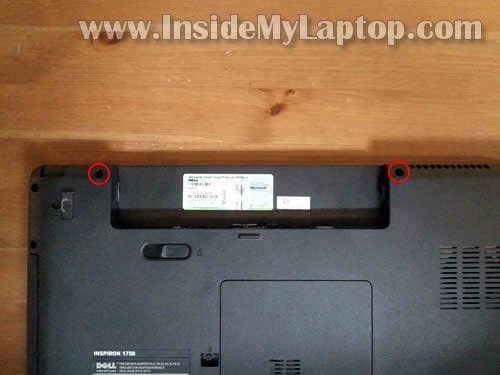 For the second time in 3 years the mouse function buttons on the Dell 1750 has become inop. The left mouse key is the one that has failed both times. I have been told it is more than 1 hour time to replace the palm rest that the touch pad is part of. The current mouse key has been in use less that 1 year. With the MTBF in the multi millions it would seem very unlikely that they should ever need replacing. 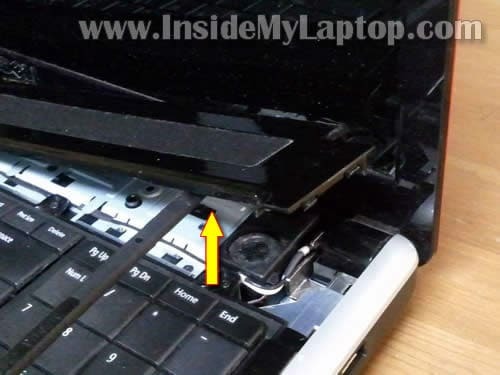 It may be more cost effective to send the computer to a repair station specializing in this type repair. Do you have suggestions as to a company involved in that area? Do you know of a video that could show the process? I have not found one with my search.